A successful entrepreneur living in Southern California, Scott Rieckens had built a “dream life”: a happy marriage, a two-year-old daughter, a membership to a boat club, and a BMW in the driveway. But underneath the surface, Scott was creatively stifled, depressed, and overworked trying to help pay for his family’s beach-town lifestyle. Then one day, Scott listened to a podcast interview that changed everything. Five months later, he had quit his job, convinced his family to leave their home, and cut their expenses in half. 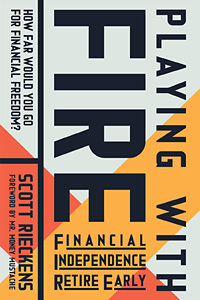 In his new book, Playing with FIRE (Financial Independence Retire Early): How Far Would You Go for Financial Freedom?, Scott brings readers along as he and his family devote everything to FIRE, a subculture obsessed with maximizing wealth and happiness. Filled with inspiring case studies and powerful advice, Playing with FIRE is one family’s journey to acquire the one thing that money can’t buy: a simpler — and happier — life. We hope you’ll be inspired by this excerpt from the book. The quest for a happy and meaningful life is not new. Socrates tells us that the secret to happiness is found not in seeking more but in developing the capacity to be happy with less. Confucius states that the more a person “meditates upon good thoughts,” the happier he or she will be. Aristotle says that “happiness depends upon ourselves,” not on the kind of watch we wear or the number of countries we’ve visited. Even modern research shows that, to quote one study, “close relationships, more than money or fame, are what keep people happy throughout their lives.” None of this is news, I’m sure. If I said, “Having a nice house won’t make you happy,” you would most likely nod and agree without hesitation. And yet many of us remain stuck in a cycle of overworking and overspending, reaching for instant gratification instead of seeking deeper and more durable satisfaction. I have been guilty of this, too: My wife, Taylor, and I sacrificed peace of mind, time together, time with our child, and meaningful relationships in order to work harder and harder so we could pay for more and more. We knew better than to think fancy cars and nice dinners would equal happiness, but that sure didn’t stop us from trying. Then, at age thirty-three, I was introduced to a fascinating phenomenon known as FIRE, which stands for “financial independence retire early.” FIRE is a growing community of people of all types and income levels committed to lives of aggressive savings and low-cost investments in order to take control of their finances and buy back their most precious resource, time. The end goal is to achieve “FIRE,” the state of having enough passive income that you live simply. In fact, despite the term “retire early” in the movement’s name, I’ve found the people in the FIRE community often reject the word retire and its implications; financial independence is about having the freedom and flexibility to pursue your true calling, whether or not it makes any money. FIRE isn’t about drinking cocktails on a beach for the rest of your life. It’s about spending your precious years on earth doing something other than sitting behind a desk, counting the minutes to 5 p.m., wishing you were somewhere else. In the process of writing this book, I came to see FIRE as the antidote to the “daily grind” of employment. Maybe you love your job. Maybe you don’t — in which case, you’re not alone: Half of Americans aren’t satisfied at their jobs. Regardless of how you feel about your job, you probably feel that you have no choice but to keep working (I know that’s how I felt). On the other hand, if you were financially independent, you could quit at any time. Even if your job is fulfilling, you probably wouldn’t mind the freedom to move on if and when you wanted to. If you depend on your paycheck, you are likely compromising on some aspect of your life, and quitting your job would mean facing financial uncertainty. But what if you didn’t depend on a paycheck? What would you choose to do then? FIRE, ultimately, offers that freedom. Sounds pretty good, right? So how do you achieve this carefree life? Well, you spend less, save more, and invest the difference. The general path to FIRE is to save 50 to 70 percent of your income, invest those savings in low-fee stock index funds, and retire in roughly ten years. Of course, the actual numbers differ for everyone, but I’ve provided the key equations and FIRE formulas throughout the book, and you can plug your numbers into these to determine whether FIRE is the right path for you. Ultimately, “spending less” is the critical, most-difficult part of this equation, and the creative, quirky, and ingenious lifestyle hacks that the FIRE community has developed are impressive, even if I have no intention of implementing each and every tactic in my own life. That’s because FIRE is flexible. You get to try it on; shop before you buy, if you will. Common FIRE practices include living with roommates or moving to a cheaper area, cooking all meals at home, buying used cars with cash, going to a one- or zero-car household, buying groceries in bulk, embracing budget or “hacked” travel, and giving up luxury purchases like fancy purses, shoes, watches, electronics, jewelry, and furniture. More extreme FIRE practitioners might live out of an RV or trailer home, grow their own food, stop shopping entirely for years at a time, bike to work in subzero temperatures, or even leave the country in search of a lower-cost lifestyle. When I discovered FIRE in early 2017, I was certainly not making choices like these. I wouldn’t have blinked at spending $300 on a dinner, flying off to Vegas for a weekend golf trip with my buds, or leasing a brand-new car. It’s an understatement to say that I was fascinated by the people making these extreme lifestyle choices. What kind of commitment does that take? What does it feel like to give up the “normal” trappings of a middle-class life? And if I had access to so many more luxuries and experiences than these people did in my everyday life, why wasn’t I happier? Or better yet, why did they seem so happy? As my excitement about the FIRE movement grew, I was also intrigued by my internal response to it and the emotional impact it seemed to have on others. Supporters referred to it as “life-changing” and “the key to happiness,” while naysayers scoffed at the idea that a frugal life could feel bountiful, and they pointed out that retiring in your forties was guaranteed to be boring. As someone who always felt like my job was the thing funding my creative endeavors, boredom didn’t concern me. The frugal part, on the other hand, terrified me. At the time, Taylor and I considered our lifestyle pretty average, though today I consider it extravagant. The idea of cutting our expenses in half seemed impossible. We led a six-figure lifestyle, which was hard to give up, especially when most of that felt like it was going to “needs” instead of “wants.” As we adopted FIRE, we struggled, we fought, we made mistakes, and occasionally, we talked about throwing in the towel and just going back to our old spending habits. But after a couple of months of drastically cutting our expenses, I was inspired by the transformational effects of living a simpler, lower-cost lifestyle. Not only did I want to continue learning FIRE tactics and philosophies, but I wanted to learn more about the FIRE community and how this idea is changing lives around the world. Since I had spent the previous decade working as a film director and producer, it dawned on me that writing a book and creating a FIRE documentary could be a great opportunity to immerse myself in this new way of life. I would use platforms that I know well to learn everything I could about something I didn’t know at all. These efforts would be a vehicle for me and Taylor to hold ourselves accountable to this new lifestyle by documenting both the mechanics of FIRE and how we were embracing its principles in our lives. From this, Playing with FIRE was born, and this book is one of the results. The documentary is due to be released in 2019. Both projects share our story long before I know how it will turn out. Will we fail? Has this been a mistake? A flop? At this point, all I know is that the concept of FIRE has improved my life, and I want to share it with as many people as possible in hopes that it will improve their lives as well. If your first impulse, as mine was, is to disregard FIRE as a bunch of penny-pinching weirdos who live in tiny homes, let me give you a snapshot of the alternative: In 2017, consumer debt hit a record high at nearly $13 trillion. At the same time, household savings hit a twelve-year low. A 2016 survey reported that 69 percent of Americans have less than $1,000 in savings, and 34 percent have no savings at all. Nobody should have to live under financial stress, and yet many of us do. I did, and our financial situation was significantly better than most: In 2016, Taylor and I made $186,000 ($142,000 after taxes), and we had just paid off the last of our combined student loans of $35,000 the year before. Still, despite our higher-than-average salaries, Taylor and I were spending almost every penny we made. If you’re like most people, your income, net worth, and level of debt aren’t things you openly discuss. A few years ago, a Wells Fargo survey found that money ranked as the number one most-difficult topic to talk about. Amazingly, death, religion, and politics all ranked beneath money. Until I joined the FIRE community, I had numerous close friends and family members with whom I could share almost anything, but I would never have discussed my paycheck or how much was in my 401k. Why? My theory is that discussing money is challenging because of all that it represents: success, meaning, power, status. Money is a shorthand for so many other things. The FIRE community couldn’t be more different. From online forums to in-person meetups to bloggers posting monthly updates about their net worth — the FIRE community is built on the principles of openness and collaboration. And as I have become more and more immersed in the FIRE community, I’ve come to see that secrecy around money harms much more than it helps. What are we trying to hide? Guilt? Shame? Fear? Is that fear originating from our upbringing? Are we afraid of being seen as greedy or as foolish? On the other hand, when we share information and knowledge freely, everyone benefits. That’s why, while writing this book, Taylor and I decided to be completely transparent about our finances: about how much we make, how much we spend and save, and how FIRE has affected us. We want to do our part to make money part of everyday conversation. Not to make our example the benchmark, not as a form of comparison. Rather, to release the power money has over us. To help you reshape your relationship with money and what it really means to you. Money is a means to an end. And your means and your end are up to you. As you read this book, even if you aren’t comfortable sharing your financial details with your loved ones, consider joining an online forum where you can talk about money honestly and openly (and anonymously, if you prefer). Everyone’s story is different, and I’m aware that the financial position Taylor and I were in when we started FIRE may not reflect yours. Neither of us grew up in affluent families, but we were both incredibly lucky to attend college, leave school with minimal student debt, and in the years afterward, avoid credit card debt. We have been blessed with good health and haven’t had to deal with any kind of financial crisis or emergency that would put us deeper into debt or limit our earnings. We are lucky to have developed skills and harnessed opportunities in industries that pay well. That said, in one significant way, our story reflects an extremely common problem: Rather than making the most of what we had, we were squandering it. Instead of maximizing our opportunities, or giving back to the world, Taylor and I were spending our lives working as much as possible so that we could slowly check off a long list of purchases that we thought would make us feel happy and important. What a waste! Like many people, as we earned more, we experienced “lifestyle creep”: the tendency to buy nicer things, eat out more, and play more expensively. Indeed, we often don’t notice all the ways our expenses rise to meet our income, and when lifestyle creep is left unchecked, it can be dangerous, even lethal, to financial health over the long term. My goal with Playing with FIRE is to offer an intimate view of an alternate path — a unique and interesting life design and philosophy that definitively bucks the trend. I’m a firm believer in “to each their own,” and clearly, this path is not for everyone. But I hope my story will inspire you to take a deeper look at your own financial and lifestyle choices. Are you trading your time for dollars? What kind of legacy do you want to leave behind? If this book, its message, and the examples in it can help even a few people live a happier and more financially secure life, then I’ll consider this effort a smashing success. Scott Rieckens is an Emmy-nominated film/video producer, serial entrepreneur, and author. Scott has spent his career as a storyteller connecting people with ideas. Along the way, his work has generated millions of views, and he has created partnerships with brands including Microsoft, NBC, FOX, Taylor Guitars, and WIRED magazine. Scott’s latest endeavor, Playing with FIRE — both the book and the documentary (limited city release dates starting in February 2019) — offers a look inside the growing community of frugal-minded folks choosing a path to early retirement. He and his family reside in Bend, Oregon. Excerpted from the book Playing with FIRE (Financial Independence Retire Early). Copyright © 2019 by Scott Rieckens.